The new St George’s Flag will be blessed on Easter Sunday during the 8 o'clock service. Tickets are, Adult £7 and Children free. All proceeds in aid of St Edmunds Church. Any donations for raffle prizes would be gratefully received. 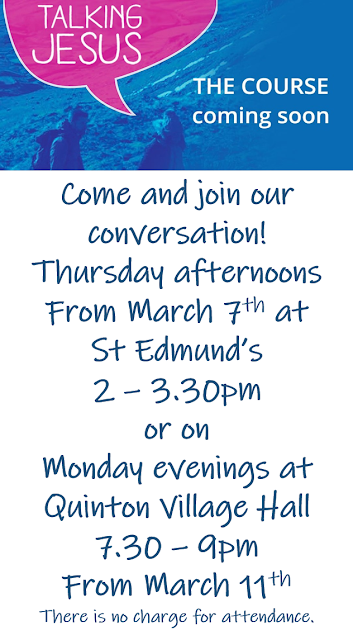 “Who is Jesus” at 4:00 – 5:00pm at St Edmunds. Invite your family, friends and neighbours to join us for a cream tea and discussion. Choir Practice 5pm at Piddington Church. Next collection of donations for the Food Bank. Toddler Praise : 9:30 – 11:30am at St Edmunds, Hardingstone. Midweek Service at 7:00pm at Piddington Church. St Edmund’s Churchyard Tidy 10:00am – noon. Knit and Natter Group at 2:00pm at Carey Chapel.